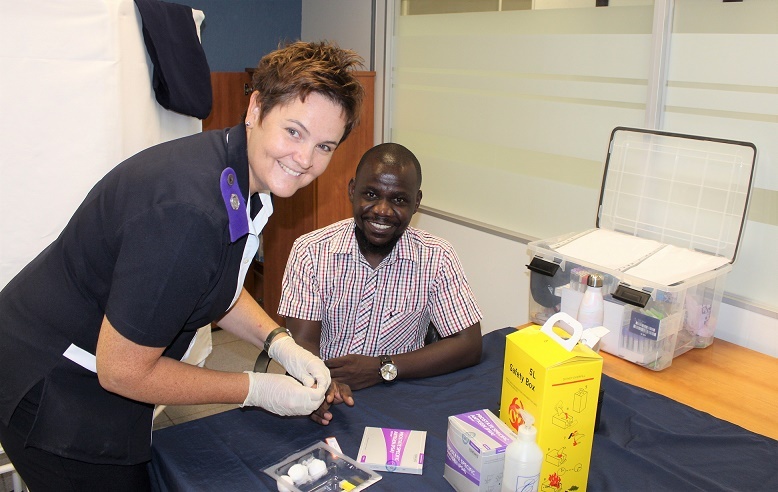 Bank Windhoek now offers quick finger prick Prostate-Specific Antigen (PSA) screening tests at their Human Capital Department in Windhoek. A statement availed to Nampa on Monday said since early-stage prostate cancer has no symptoms or signs, it is usually detected through a PSA test. The screening, which offers instant results, is aimed at saving the lives of male employees since signs of the disease usually only present themselves at an advance stage of the prostate cancer. Bank Windhoek’s Corporate Wellness Consultant, Marjolize Scholtz, said that if the test indicates that prostate cancer may be present, more monitoring and testing will be done via their doctor to diagnose prostate cancer of any other underlying cause. “Prostate cancer is on the increase in Namibia and it is of great concern that most of the cases are only being diagnosed at a later stage of the cancer. Knowledge is key and can change the lives of men drastically,” Scholtz said. Bank Windhoek encouraged its male employees to visit the clinic for prostate cancer screenings and that they should consider monthly testicular self-examinations and annual medical check-ups. The statement further said that men with advanced prostate cancer may present the following symptoms; frequent urination, weak or interrupted urine flow or the need to empty the bladder, the urge to urinate frequently at night and blood in the urine and seminal fluid.